SANTA MONICA, CA--(Marketwire - June 4, 2007) - Since 1996 WestsideRentals.com has successfully connected hundreds of thousands of quality tenants with landlords and roommates. WestsideRentals.com is the definitive location for owners and managers of Los Angeles rentals to locate quality tenants searching for apartments in Los Angeles, condos in Los Angeles, houses for rent in Los Angeles, and guest houses for rent in Los Angeles. Initially started in Santa Monica, due to overwhelming demand from landlords in need of quality tenants to fill their vacancies, WestsideRentals.com has grown to cover most of Southern California. As a service to the rental community we regularly publish rent surveys to assist in making the rental market more transparent and efficient for all of its participants. For May 2007, the average listed rent price of all listed rentals in these areas was $2,138.78, representing a 3.0% increase over two months ago. This was a general price increase across all rental types, with about 27% of listings in the West Los Angeles - South region being houses, duplexes, or triplexes, as opposed to apartments, condos, or townhouses. This ratio of houses to apartments was relatively unchanged over two months ago, when approximately 25% of listings in these areas were listed as houses, etc. There was almost no change in the size of the listed rentals, as measured by the number of bedrooms. About 54% of the rentals listed in the West Los Angeles - South region have two or more bedrooms, with the rest being studios, singles, and one bedrooms. This has changed little in the last two months, when that percentage was about 53%. The largest rent increases occurred in Playa Del Rey, where the total increase was 20.8% and Marina Del Rey, where the total increase was 18.1%. 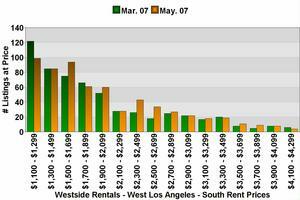 Rent prices also increased in Mar Vista (Up 10.1%), Playa Vista (Up 9.5%), Culver City (Up 4.5%), and Palms (Up 3.8%). Rent prices decreased in Westchester by 8.1% and Venice by 7.2%.